This Wilson Pro 70 cellular signal booster can’t be sold by itself. It’s actually illegal to do it. It’s designed only for installers who create custom solutions for larger installations. 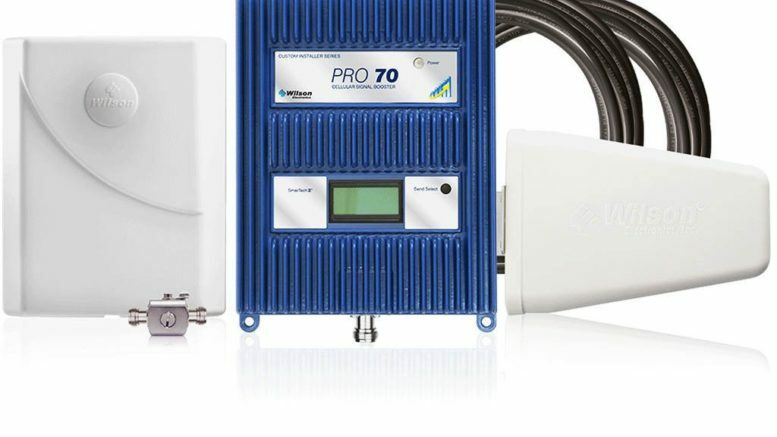 If you truly need to boost signal in a large area like a warehouse or airport, there are a lot of off-the-shelf solutions, but should you use a custom installer instead? It’s a hard question to answer. A lot of times those off-the-shelf kits do actually work very well. Bringing someone out to survey the property and recommend the correct setup could cost you money and time. But then again, doing it wrong will definitely cost you money and time. Personally I think the only reason to use a custom installer in a home or small office is if you don’t want to go up on the roof. Most cellular signal booster solutions require an outdoor, roof-mounted antenna in order to work. If that’s just not something you’re comfortable with, hire a contractor or electrician to go up there. He or she won’t need any special training. However, if you really do need a custom solution, you’ll be pleased to know that there are Wilson and SureCall certified installers out there who can check out your specific location and recommend a solution that is custom designed for you. It may include more than one antenna, or a pro-level booster like the one you see above, It may require more expensive but higher-quality cable so that the long runs between booster and antennas don’t have so much loss. There are a lot of variables in a large install, far more than in smaller ones, and that’s why I do think a custom quote makes sense once you get about 10,000 square feet. There are some off-the-shelf solutions up at that level but there are also tons of installation options that you need to consider. If you’re worried about where to start… Don’t! It’s super easy, just give us a call at Solid Signal at 877.312.4547 and we can recommend the right system, whether you’re looking for something custom or something off the shelf!